This Russian salad, a traditional salad of Soviet cuisine, vinegret is often associated with herring, vodka, and the party mood. Not to confuse with French dressing vinaigrette, vinegret is a simple and very tasty vegetarian salad. It is quite easy to make with the ingredients you can buy in any supermarket. Substantial enough for a light lunch or dinner you can also serve it in small portions as a starter. The basic recipe below is how our grandmothers cooked it, but if you feel like experimenting, I also listed optional ingredients you can add to it. This is my family’s favorite winter salad, a staple of the holiday as well as everyday menu. My guests love my "russian salad", my friends always request it for potluck dinners, and I urge you to try it, too – you won’t regret it. Bake the beets, or cook unpeeled beets using one of the basic methods. To bake, preheat the oven to 375°F. Wrap the beets in aluminum foil and bake until tender, about 1 hour. When the beets are cool enough to handle, peel and cut into ¼- or ½-inch dice. While the beets are baking, cook unpeeled potatoes and carrots in lightly salted water for 25 min. Rinse with cold water when done, and peel preferably while they are still warm. Cut the vegetables into ½-inch dice. Rinse the sauerkraut (if necessary) and drain, pressing excess liquid out. 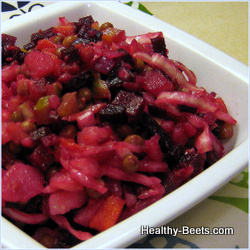 In a large salad bowl, combine the beets, potatoes, carrots, peas, pickles, sauerkraut and onions. Season with salt and toss gently. Add the oil and toss again. Taste for salt. Let the salad stand in a cool place or fridge for at least 30 minutes (or a couple of hours) to merge the flavors, and serve. Beets will color the salad crimson, which I prefer. If you want the vegetables to retain their own colors, toss the diced beets with oil in a separate bowl, combine and toss the rest of the ingredients with oil, and add the beets to the main bowl last. Salad leftovers will keep in the refrigerator for 2-3 days. You can cook beets in water or in the microwave for this recipe, but the baked beets will add a sweet smoky taste and a wonderful flavor to the salad. If you have skills and time, cut your vegetables into the smallest dice, about ¼-inch – the salad will taste better. Homemade sauerkraut is the best for this salad. But, if you buy from the store, look in the deli section and select fresh refrigerated sauerkraut rather than canned. Substitute canned peas for cooked beans. Soak raw onions in water from 10 min to 1 hour, and then rinse to wash away some of their pungent flavor. Mix the oil with a little mustard and lemon juice before dressing the salad, and add finely cut slices of lemon for garnish.